Since it was the day of Preparation, the Jews did not want the bodies left on the cross during the sabbath, especially because that sabbath was a day of great solemnity. So they asked Pilate to have the legs of the crucified men broken and the bodies removed. 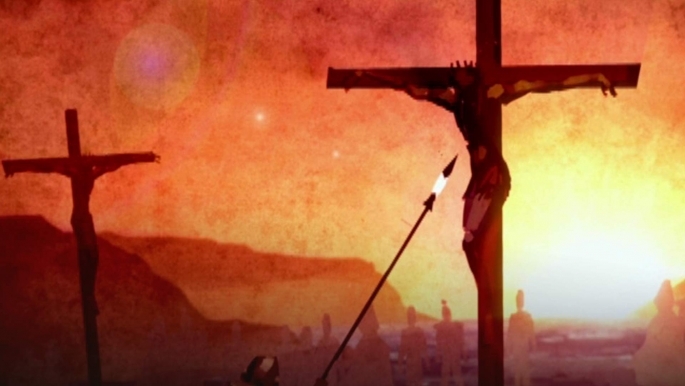 Then the soldiers came and broke the legs of the first and of the other who had been crucified with him. But when they came to Jesus and saw that he was already dead, they did not break his legs. Instead, one of the soldiers pierced his side with a spear, and at once blood and water came out. Maybe some of our scars won’t follow us into resurrection, I don’t know. But Jesus had scars on his resurrected body. On his hands, on his feet, on his sides. Scars that proved that he lived, and that he loved. Scars that remind me of who he is and how he loves. He let Thomas touch them. Maybe someday he’ll let me touch them. He was wounded and crushed for our sins. He was beaten that we might have peace. He was whipped, and we were healed! The Anima Christi is a medieval prayer to Jesus in the tradition of the Roman Catholic Church. This translation is by Cardinal John Henry Newman. Click here, for Steve Garnaas-Holmes meaningful prayer on Thomas’ encounter with the Risen Christ entitled A Prayer to St. Thomas. Also consider his posts entitled, Thomas’ Prayer and The Mark of the Nails. This entry was posted in Lent/Easter, Quotes and tagged crucifixion, doubt, grace, healing, pain, resurrection, suffering, wholeness, wounds by revlisad. Bookmark the permalink.